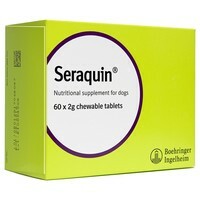 Seraquin for Dogs 2g Tablets. Seraquin contains Glucosamine and Chondroitin; ingredients which help rebuild joint cartilage as well as providing anti-inflammatory effects. The Chondroitin slows the degeneration of cartilage whilst providing the building blocks for new cartilage, also contains turmeric extract, which is important for maintaining healthy cartilage. Use Seraquin for dogs daily for the relief of pain and to increase the mobility of your dog suffering from arthritis of degenerative joint disease. If the weight of your pet is <10kg use Seraquin for Dogs 800mg. Reduce the dose after 4-6 weeks as you see the beneficial effects. Inactivated Yeast, Glucosamine HCI 500mg, Saccharose, Chondroitin Sulphate 380mg, Hydrolysed Chicken Protein, Standardised Turmeric Extract 50mg, Glucose, Maize Protein. When we took our 6 year old springer to the vets with a limp. We where told it was arthritic and suggested we try Seraquin. Within a couple of weeks the limp improved and he is more like his old bouncy self. Well worth the money. I HAVE USED THIS PRODUCT ON MY 4 YEAR OLD CAVALIER WHO INJURED HIS FRONT LEG WHEN JUMPING OFF THE BED AFTER SEEING 3 VETS AND 3 PRESCRIPTIONS OF RAMIDYL WITH NO SUCCESS I PURCHASED SERAQUIN AS A LAST RESORT AND WAS DELIGHTED WITH THE RESULTS. I WOULD RECOMEND THIS PRODUCT TO ANYONE WITH A DOG WITH JOINT PROBLEMS OR JOINT INJURYS. One of my German shepherds was diagnosed with hip dysplasia when he was 5 years old. He was unable to stand up. After initial steroid treatment he went on to use Seraquin and still does to this day. He will be 10 years old in September and bounces around like a puppy. These tablets do a wonderful job and are supplied by Vet UK at an extremely reasonable price. I can't recommend them more highly. My labrador was diagnosed with osteoarthritis in March 2010, she has this in both front legs (elbows) and was limping very badly.I was devastated - she was 7 at the time (8 last month). Since March she has been having these tablets daily and the improvement has been amazing. She is also on Hills prescription diet which I purchase from you as well as the Seraquin tablets and due to the weight loss AND these amazing tablets Poppy has improved unbelieably and can now exercise again and is enjoying her walks once more. I truly thought we would never be able to have our walks again back in March but now she is doing incredibly well and I can only say a big thank you to Seraquin and Vet UK for such good affordable prices. I am so, sooooo happy. I have been using this product for a little while and it has a had wonderful effect on my Cavalier (Aged 11 and diabetic. It was great to find I could purchase through VetUK for £10 cheaper than my Vets and the service was excellent. Over the moon with the results on my elderly King Charles. Just wish I could take some myself! Fantastic product... my arthritic 13yr old golden lab is now running about like a 3 year old !! My 12 year old poodle is now walking about again enjoying life. This is a wonderful product and I cannot find it cheaper anywhere on the Internet. As for service and delivery terrific. This product was recommended to me by a friend for my old dog who had been on Rimadyl from the vets for several years. I have used Seraquin now for more than a year and no longer use the Rimadyl as she is far better on this. She still enjoys a walk at 17 and a half years old! Top class product and top class service at a good price from Vet UK-can't be faulted! Excellent product. After about 3 weeks noticeable improvement in mobility; starting at 3 tablets each day for a week, then 2 a day for 2 weeks, then 1.